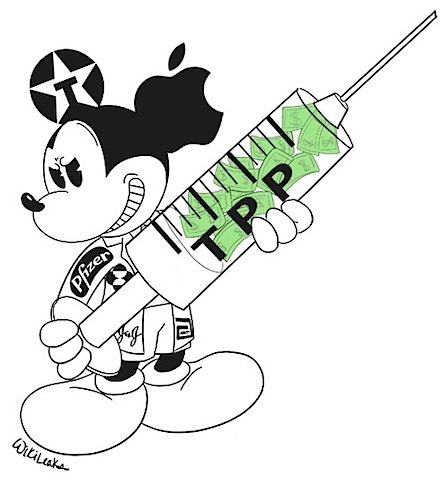 WikiLeaks published more secret documents from the controversial TPP agreement on Wednesday. The leaked drafts concerning healthcare in the US have activists worried the agreement might play into the hands of big pharmaceutical companies. The secret Trans-Pacific Paternship (TPP) negotiations showed that the Healthcare Annex has been seeking to regulate state schemes for medicines and medical devices. WikiLeaks said "it forces healthcare authorities to give big pharmaceutical companies more information about national decisions on public access to medicine." The secretly negotiated trade deal has been widely opposed by industry professionals and activists in many countries, as it could "empower big pharmaceutical firms to command higher reimbursement rates in the United States and abroad, at the expense of consumers," the New York Times wrote. "American negotiators are still pressing participating governments to open the process that sets reimbursement rates for drugs and medical devices," the publication added. The latest disclosure links the Healthcare Annex to the secret draft "Transparency" Chapter of the TPP, along with each country's negotiating position. The leaked "Annex on transparency and procedural fairness for pharmaceutical products and medical devices" is dated from December 2014, with the draft being restricted from release for four years after the passage of the TPP into law. Pharmaceutical giants, mostly based in the United States, are "protecting profits over public health," WikiLeaks says. Customers in poorer countries could suffer even more as neither governments or the local population "can afford to pay rates anywhere close to those charged in the West." "I think it's a shame that the annex is still being considered at all for the TPP," Deborah Gleeson, a lecturer at the School of Psychology and Public Health at La Trobe University in Australia told the New York Times, adding it "was very clear to everyone except the US" that the proposal is not about transparency, but rather over a "decision-making processes around pricing." The newly leaked details from the secret trade negotiations among the 12-nation TPP bloc have worried experts from several countries, with analysts from Australia and New Zealand raising the alarm. The secret negotiations now allegedly reveal that Australia's Pharmaceutical Benefits Scheme might be undermined, pushing up the cost of medicines in the country. "United States trade negotiators have aggressively pushed for provisions favoring multinational pharmaceutical manufacturers at the expense of national governments and public healthcare systems," the Sydney Morning Herald wrote. "The Annex will also tie the hands of the US Congress in its ability to pursue reforms of the Medicare program," the transparency group's expert policy analysis revealed. The leaked TPP document "shows that the pact could expose Medicare to pharmaceutical company attacks and constrain future policy reforms, including the ability of the US government to curb rising and unsustainable drug prices," the US consumer rights advocacy group and think tank Public Citizen said in its Wednesday statement. The group says president Obama's administration has been "acting at the behest of pharmaceutical companies," and the secret negotiations it has been holding within the partnership might affect Medicare, limiting "Congress' ability to enact policy reforms that would reduce prescription drug costs for Americans." According to the New York Times, the latest TPP leak was released "ahead of the House vote on whether to give President Obama expanded powers to complete the Trans-Pacific Partnership." The president's "fast-track" power "to complete trade deals that cannot be amended or filibustered by Congress" has already been approved by the Senate. It's not the first time the Annex has been leaked to the public - the secret document has already been published in 2011. Although some healthcare harmful provisions have been removed, there is still a number of "serious questions and concerns," the US think tank says. More than 25 chapters of the document remain secret. A proposed free trade agreement between the US and eleven other states, including countries like Australia, Japan, Peru and Vietnam has been negotiated for several years. According to Public Citizen, once the TPP is agreed, the US "has ambitions" to apply its terms to all Asia Pacific Economic Cooperation (APEC) forum members, which makes up roughly 40 percent of the world's population. This month, WikiLeaks has already published secret documents related to controversial agreements currently being negotiated behind closed doors between the US, EU and a number of other countries. Parts of the so-called "Great Treaty" - the TPP, Trade in Services Agreement (TiSA) and Transatlantic Trade and Investment Partnership (TTIP) have been leaked. Some believe "the mounting public pressure" on secret negotiations "is bearing fruit," after European Parliament decided to postponed a key vote on the TTIP resolution this week at the last minute. This page contains a single entry by Archimede published on June 11, 2015 9:08 AM. Estimating the global burden of cancer in 2013; 14.9 million new cases worldwide was the previous entry in this blog. Nazi Mass Murderer Became Chairman At Vaccine Drug Company In 1950s is the next entry in this blog.